Women have been warned off several common errors made regarding making up their eyes. In an article for UAB Kaleidoscope, Jamie Walden cited clumpy mascara and shimmering eyeshadow on the brow bone as two looks to avoid. 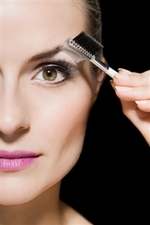 She urged women to buy good quality mascara and not use it for longer than a month, as well as being sure to apply the cosmetic with a clean wand. Brow bones covered with shimmery shadow were described as "cheap" and women were recommended to apply it lightly to the corners of their eyes instead. Ms Walden also pointed out the difference between "smoky and skanky" for eyes and advised against applying too much black. Jewel colours such as turquoise should be used only lightly and not with too much colour elsewhere on the face. Model turned makeup artist Jemma Kidd recently wrote in the Daily Mail that women with sensitive eyes should steer clear of highly coloured or glittery eyeshadow.